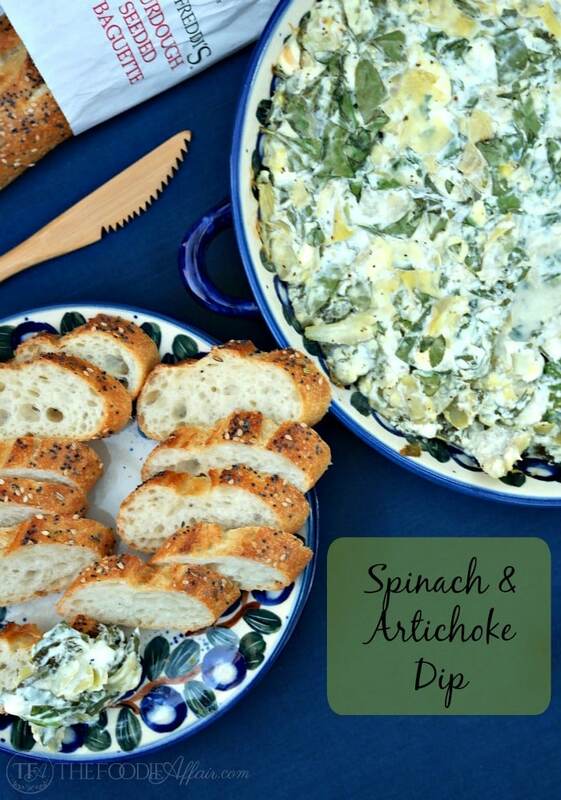 Rich and creamy Spinach and Artichoke Dip! This classic recipe is lightened up. Serve bubbling hot, right out of the oven! Ok, guys, so this weekend is the big Super Bowl game!! I can pretend to know what the heck is going on, but I’m a horrible faker and would embarrass myself by making reference to the wrong sport or something as equally mortifying. I’ve tuned out all the hoopla details. Don’t get me wrong, I love going to live football games, and I once was the parent that yelled like a crazy person cheering for my son the years he played high school football. That was fun times, but sitting in front of a TV is not my idea of a good time (hardly watch any shows!). The brouhaha is background noise for me because instead of occasionally watching football, it seems like there is always some BIG game going on! Am I right? Alan and Sam totally get into the season and love the football schedule, so watching the Super Bowl is a must, even if your favorite team isn’t in the game! The game is exciting for fans and I totally get it! If I paid closer attention I would know the starter’s stats or at least the position of each of those top-notch players because I hear a lot of discussion between my guys! That’s that part of the game I do enjoy, listening to the two of them yell “Ahhh, COME ON…WHAT WERE YOU THINKING…ARE YOU KIDDING ME? !” and other choice words! Their bonding moments over the game makes me grin from ear to ear, but that’s just between us, K? The other positive side to this football wrap-up is the GRUB! Oh, my goodness, nachos, wings, burger, pizza, chili cheese fries, and whatever else you can dream of is a go for game watching! You can pretty much make a few appetizer and call it dinner and EVERYONE is happy! 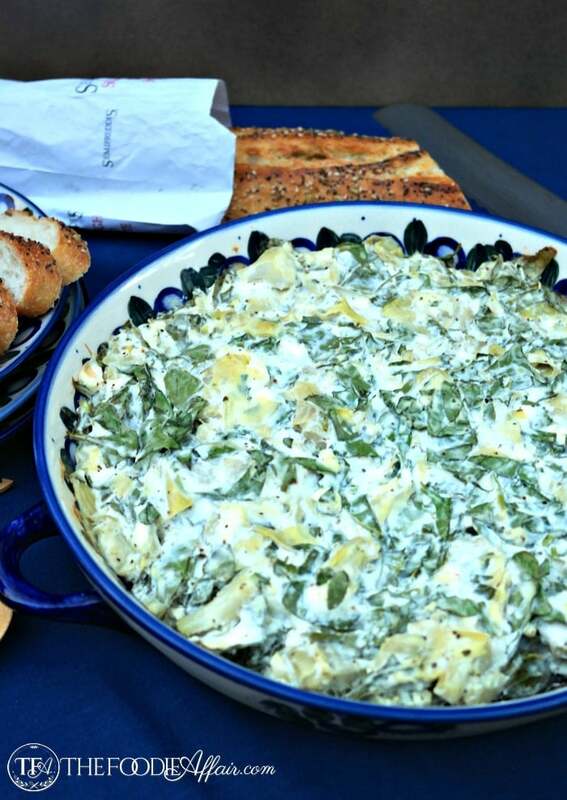 This Spinach and Artichoke Dip is a classic and a great choice if you want to add some veggies to your game day menu. I know you’ve eaten a variation of this dip. It’s a good recipe to have in your arsenal of tasty foods. The original recipe has lots of fat from the mayonnaise and cheeses, so I’ve updated the dish by using a lower fat cheese, fresh instead of frozen spinach, and I skipped a portion of the cheese so you can save those calories for beer or dessert! You’ll love the rich and creamy texture of this dip along with the chunks of artichokes that you’ll taste in every bite! In a large bowl mix together Neufchâtel, greek yogurt, lemon juice, garlic, salt and pepper until well blended. Mix in artichokes and fresh spinach combining all ingredients together. Put mix in a baking dish and bake for 25-30 minutes. 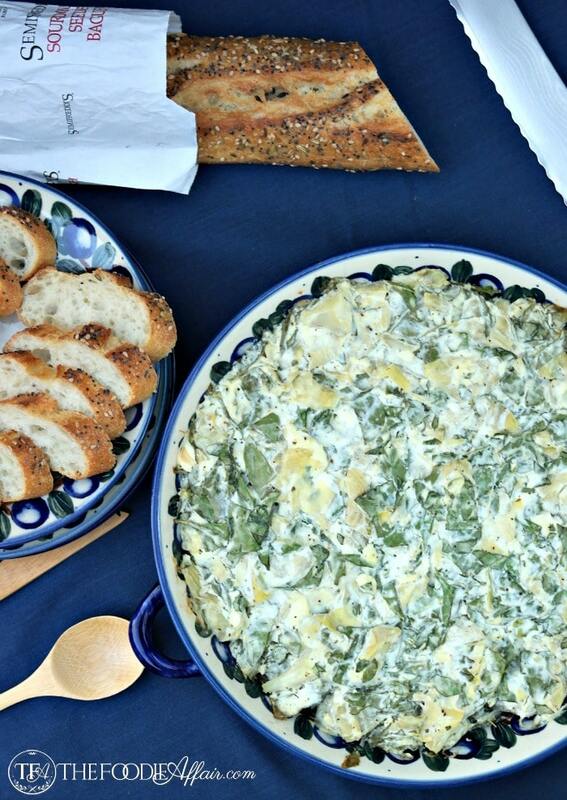 spinach artichoke dip is a favorite Sandra! this sounds amazing – and healthier! I try to save a few calories for my sweets 🙂 I could eat this dip as my whole meal. My favorite too! This is one of my favorite dips, I love how you lightened it up! I love that you can serve this dip and everyone is familiar with the flavor. Bet no one will notice that I cut out extra calories! I think I will make this for super bowl. Such a great recipe! I hope you do, Sarah! Thanks! This would be perfect for Sunday’s big game!! Thanks for sharing! I’m glad you like this dip recipe, Yvonne! Thank you! Great ingredient list!! Sounds so amazing!! Thank you, Sheena! I’m really pleased with the way this came together. This is exactly what I want right now! sounds amazing! It’s a pretty darn good snack got anytime! This is probably our favorite dip of all time, so I’m happy to have a lightened up version of it available 🙂 Thanks!! 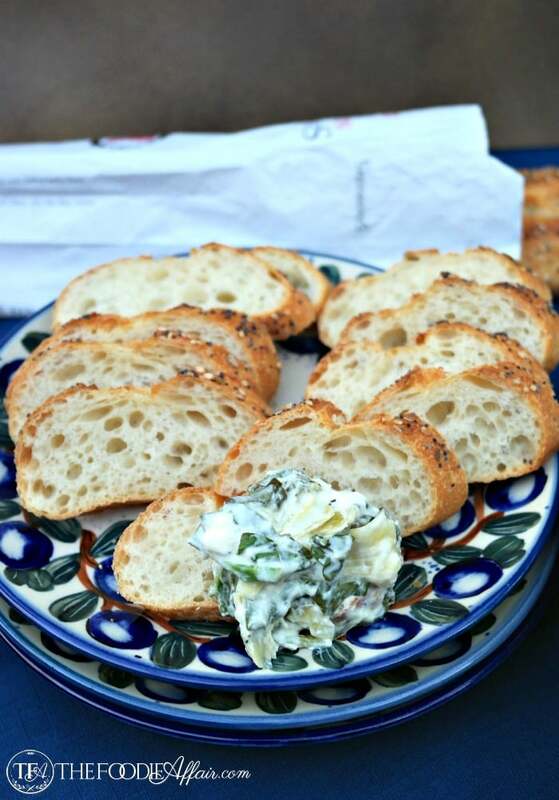 I love that you lightened up our favorite dip and used fresh spinach! I’m totally going to have to make this! Thanks, Michele! I have a hard time buying frozen veggies when fresh ingredients are available and so vibrant in my produce section! Plus, it really helps not to have to drain all the extra water that frozen spinach has. 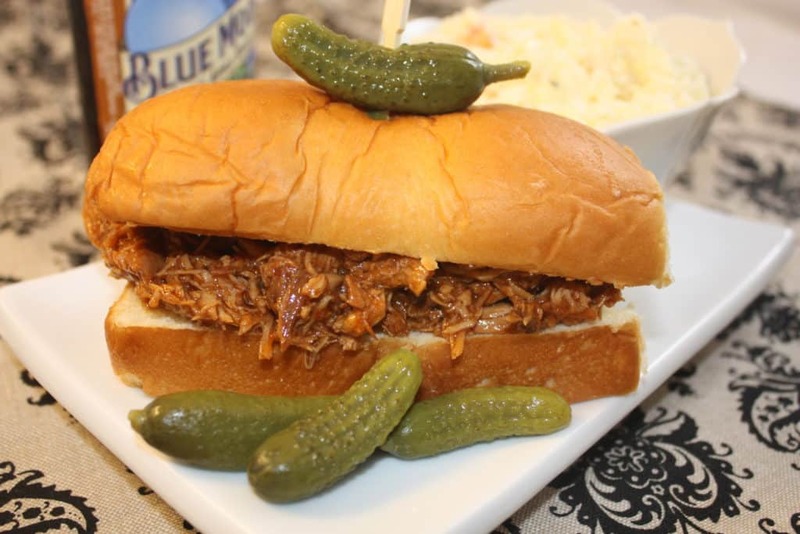 Totally earmarking this recipe to make for the Super Bowl this weekend! I need something on the lighter side to keep me from the really bad stuff. 🙂 Thanks for sharing!